the criss cross mini stencil. sprayed with water once happy with the result I dried it all off. clock stamp on it with archival. came a coat of Raw Umber antiquing cream, finally black antiquing cream. and finally a coat of white antiquing cream. was created with quinacridone gold. or let me know what you think. Tando Tags, circles, Industrial elements bolts and washers sheet, Stencil"s distress harlequin, criss cross & Sunderland post mark. Deco Art Matt Medium, gloss varnish, ultra matt medium, modelling paste, Ferro graphite, white tinting base, raw umber & Prussian blue hue, Antiquing cream in Patina, white, black and raw umber. Hi! 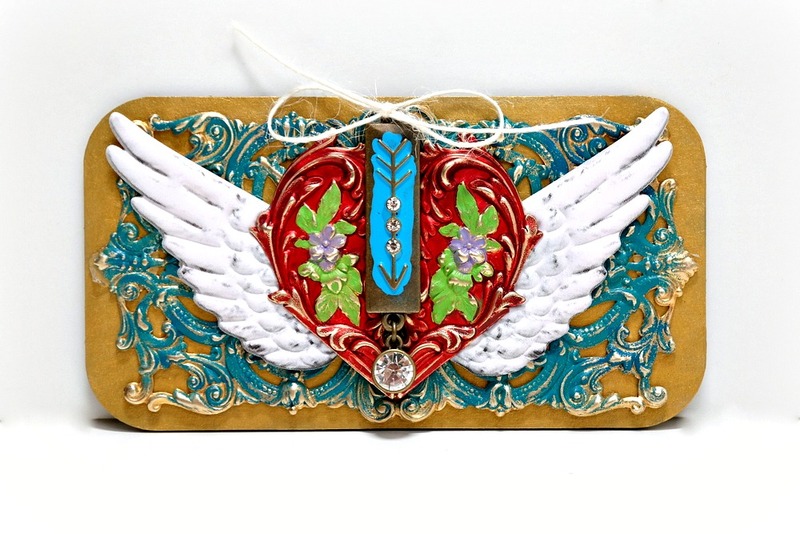 Dana here today sharing a Mixed Media Board that I altered for the Antiquing theme this week. I love working with Tando chipboard for many reasons, but today I'm really celebrating the strength of these boards. I added two large pieces of brass, plus other embellishments, to this board without any structural issues like bending, cracking, or breaking! If you're looking for strong bases for your mixed media and assemblage projects I highly recommend Tando Mixed Media Boards. These boards also look fantastic when embossed and they'll hold up to punching. I applied a base coat of metallic paint to the board and then prepped two brass pieces from the Lisa Marie Jimenez Etsy Store for painting by cleaning with rubbing alcohol. I painted the decorative rectangular brass piece with Pacific Ocean and Verdigris ColoriQue. Once the paint was dry I sanded the brass for a distressed look. 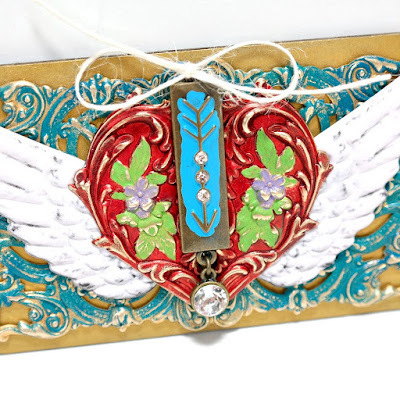 I glued the decorative brass piece to the board and then topped it with the 7gypsies Architextures Findings Angel Wings Embellishments. Next, I painted a decorative brass heart with Ruby Slippers, Avocado, and Wisteria ColoriQue. Once the paint was dry, I sanded the brass for a distressed finish and then glued it down on top of the wings. To complete these piece I added a metal arrow charm and a twine bow to the center of the heart. You can find the mixed media board I used for this project in the Tando Creative Retail Store. 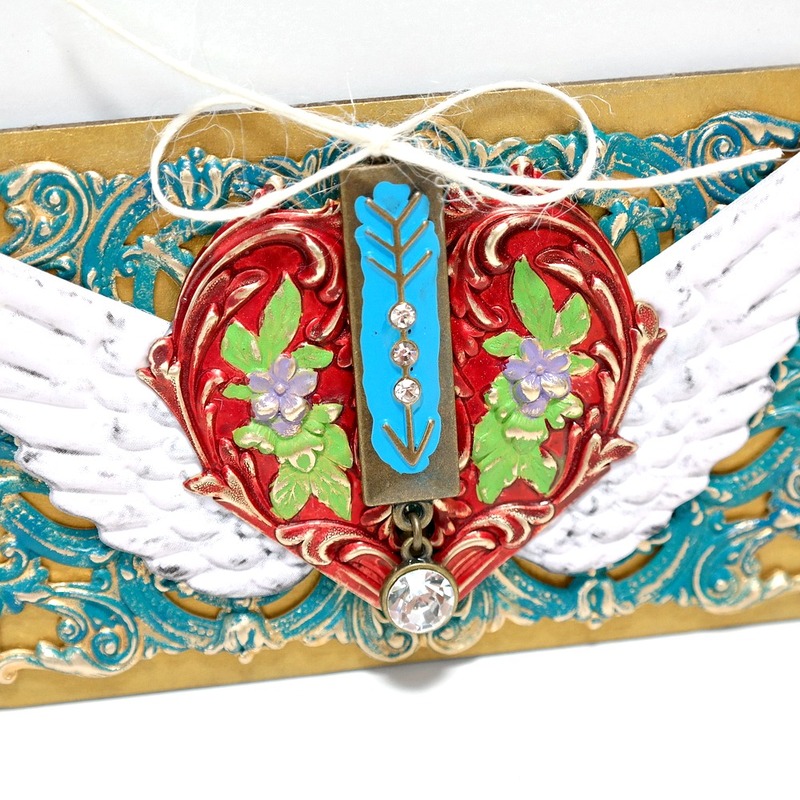 There are several chipboard sets available with wings that would work great in place of the wings stickers I used for my project. We'd love to see your creativity! Share your work with us in Tando's Creative Zone on Facebook. ColoriQue is a fabulous ink that brings color to metal, but also so much more. There is absolutely no prep work or special tools required to apply ColoriQue to most metal, raw brass being the exception, which needs a quick cleaning with alcohol before coloring. Blend and layer different shades of ColoriQue for unique effects. Distress dry ColoriQue with sand paper for an aged finish. Also, try adding ColoriQue to clay, ceramic, glass, wood, chipboard, and leather. ColoriQue dries quickly and is studio safe. Visit Lisa Marie’s Shop to purchase ColoriQue. This weeks theme @ Tando Creative is "As seen on HOCHANDA" week. Tando Creative has appeared on HOCHANDA a few times, most recently being the 24th May. Sooooo.... The Tando DT decided to show off our samples we did for the show. I did a few different samples with Tando's Whimsical Birds 1 and Whimsical Birds 2 and Tando's Shadow Frames. 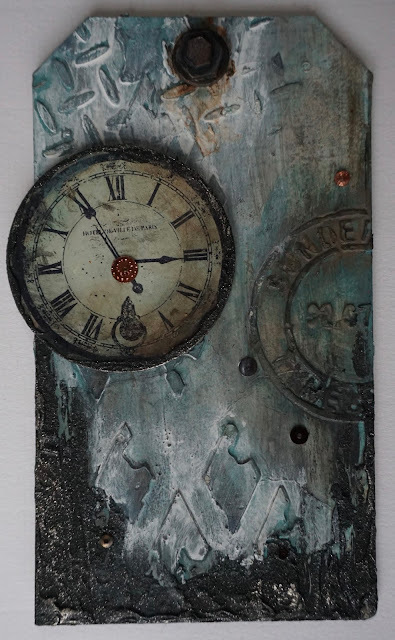 I used lots of DecoArt products on these samples including Texture Sand Paste, White Gesso, White Modelling Paste and Crackle Paint along with many colours from the DecoArt Media Acrylic Paint range. I also used many of the 4 x 4" masks from Tando. This is a 12 x 12 inch design I did on greyboard. I did lots of stencilling and stamping with inks and paint to create the background before adding the Whimsical Birds. 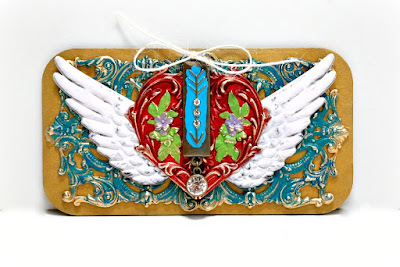 These are three tags I made using Tando Whimsical Birds, DecoArt products and Stampendous stamps. This sample I created using Tando off-cuts of greyboard. Every bit of left overs come in handy. That's why us crafters never throw anything away!!! These are 3 oval plaques I did with the Whimsical Birds using yummy DecoArt Products and Stampendous stamps. 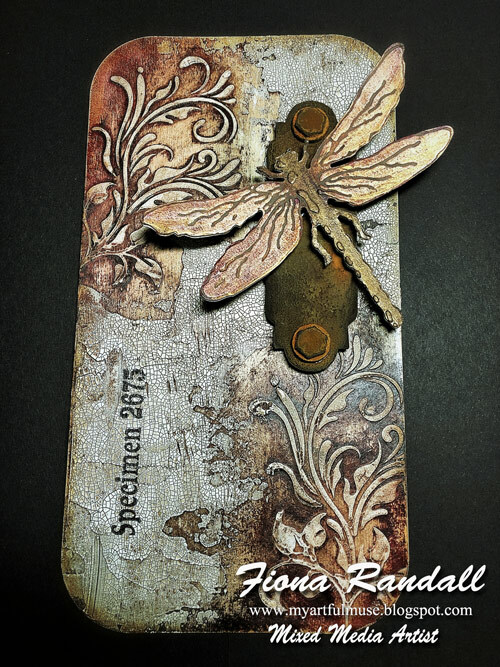 shadow plaques - I created these using Tando stencils, DecoArt texture sand paste, crackle paint, white modelling paste, DecoArt Media Paint Tando stencils and Stampendous stamps. Thanks for popping by the Tando blog today. I hope you like my HOCHANDA samples, if you wish to pop over to my blog and leave a comment please do, I love hearing what you all think. Here all all the lovely products I used to create them. They are all available on the Tando website.